I was asked to do some briefing notes about data and smart analytics for a strategy paper. I thought I’d share them here. A data-driven organization is one that understands the importance of data. It possesses a culture of using data to make all business decisions. “…a data-driven government is one where, for all critical decisions, actionable information is available when and where needed. The benefits are almost incalculable. Many datasets can be published as Open Data and visualised as dashboards. Data should be more easily shared between departments – to support a single user view and to provide canonical sources of data. Government has loads of data, but has traditionally been used for operational purposes, then stored, forgotten or deleted when legal limit of life is reached. Fraud and error detection has been a big driver for analysis in government. Is the examination of data or content, usually manually performed, to answer the question “What happened?” (or What is happening? ), characterized by traditional business intelligence (BI) and visualizations such as pie charts, bar charts, line graphs, tables, or generated narratives. Is a form of advanced analytics which examines data or content to answer the question “Why did it happen?”, and is characterized by techniques such as drill-down, data discovery, data mining and correlations. 4. (increasingly) An emphasis on ease of use, thus making the tools accessible to business users. is a form of advanced analytics which examines data or content to answer the question “What should be done?” or “What can we do to make _______ happen?”, and is characterized by techniques such as graph analysis, simulation, complex event processing, neural networks, recommendation engines, heuristics, and machine learning. As we move towards 2030, government needs to use descriptive and diagnostic analysis of data more effectively, but the real transformation is in using predictive and prescriptive. 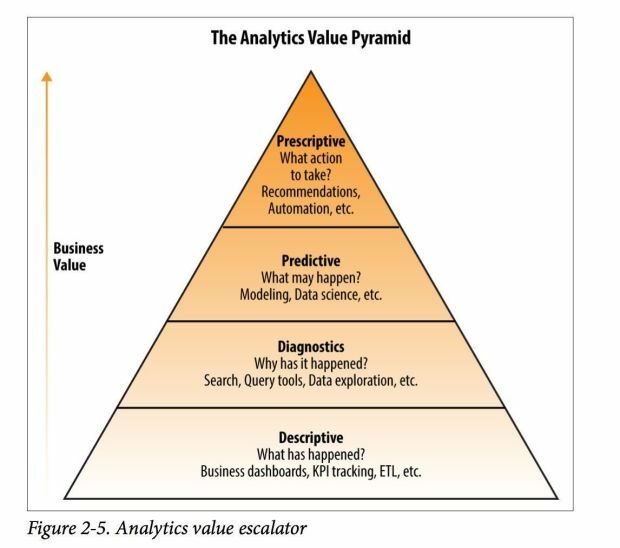 The most effective approach is to identify an opportunity or challenge and determine how an analytics model can help solve it. In other words, you don’t start with the data—at least at first—but with a problem. A data-driven organisation is one that understands the importance of data. It possesses a culture of using data to make all business decisions. Data professionals must understand what decisions their business users make, and give users the tools they need to make those decisions. Data professionals need to beware of cognitive and unconscious bias in their analysis, tools they use and create and in their data story-telling. Colleagues need upskilling to know what good looks like, to ask the right questions and challenge and to self-serve accurately. For all critical decisions, actionable information is available when and where needed. What is the remit of digital services in the context of a proliferation of data across society? Shouldn’t we be just talking about government services, rather than digital services now? Need to consider the original Government as a Platform principles – that government builds the data infrastructure so that third parties can provide the most relevant services (that may include a government service element) to users – dependent on context, situation, location etc. Third parties may well have a richer picture of users needs and context – eg having a baby. How does this affect the “right place” for services to be delivered, in or out of government? As above – need to consider the original Government as a Platform principles – that government builds the data infrastructure so that third parties can provide the most relevant services (that may include a government service element) to users – dependent on context, situation, location, life event etc. government. Definition of Real-time analytics is the use of, or the capacity to use, data and related resources as soon as the data enters the system. The adjective real-time refers to a level of computer responsiveness that a user senses as immediate or nearly immediate. Real-time analytics is also known as dynamic analysis, real-time analysis, real-time data integration and real-time intelligence. (SearchCRM).